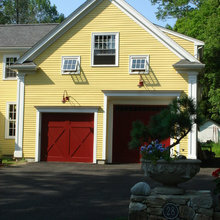 Dan Farrace Fine Woodworking was founded in 1990 with the goal of providing clients with best-in-class, quality products. 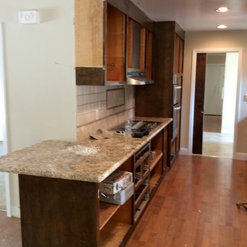 I have extensive experience in building custom furniture and now apply my background to not creating furniture, but also high-end cabinetry and mill-work. I pride myself on setting a very high standard for my work and never cutting any corners. My goal is to work hand-in-hand with my clients to ensure their needs are met. I will start the design process by meeting with you and discussing what you are looking for. Our open conversation will allow us to create a design that is of the highest quality before moving into the build and installation phase. Call or email me today to discuss your project in more detail and how we can work together to bring your project to life. 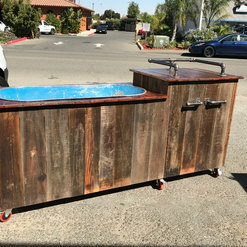 Dan did 3 bathroom vanities for us in 2015 and they have held up great and still look great. Very solid, functional, good looking both in fit and finish (European style with soft close doors/drawers). Dan was easy to work with, on time, and exactly on budget. In particular, the long double vanity for our master bathroom is made out of bamboo and is stunning. He was also sensitive to our desire to not spend so much on a kids bathroom vanity... but that one came out excellent as well! Our contractor was surprised that Dan did the installation himself and did a great job. Dan is a real professional and a very nice guy to boot. If you are looking for top quality and service Dan delivers! I am very happy with his work, which included building and installing cabinets of distressed hickory through out my home. I found him knowledgeable, professional and punctual, all things I look for in a sub-contractor. 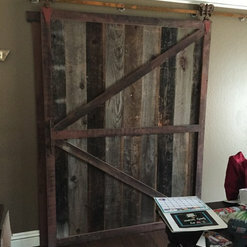 Dan's reclaimed wood working is top notch. 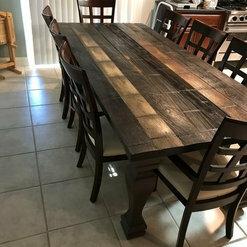 He built countertops for the game room from reclaimed material and they are absolutely stunning. I highly recommend Dan Farrace Fine Woodworking to anyone looking for custom cabinetry to reclaimed wood works. If you have high expectations for your project, want a meticulous professional with great ideas, and demand awesome customer service, then Dan's your man. 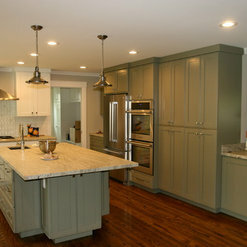 Our most recent project was a kitchen cabinet makeover. I knew Dan would do a great job but the results were even better than we had hoped for. No shortcuts, no attitude, no hassles. Just beautiful work completed on time. We've built and remodeled several homes and I can honestly say Dan is one of the best contractors I've had the pleasure to work with. If you expect the highest quality work done as - and when - promised, sign on with Dan. You'll be glad you did. Dan delivered exactly what we asked him to do for us and we couldn't be happier with the finished product! We were re-doing our white brick fireplace with stone, and decided we wanted an old wood mantle and custom bookshelves on either side. He found the perfect piece of weathered wood for the mantle and created exactly the bookshelves we were looking for on either side of the fireplace. He coordinated his work with our stone mason, which isn't always easy to do. We would highly recommend Dan's professionalism and his listening to what the client really wants to anyone! We recently finished the almost full renovation of our home. Dan did the built in cabinets in our living room, which was the focal point of the entire renovation. His work was absolutely beautiful. 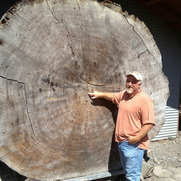 The wood he used was top quality and the craftsmanship was impeccable. Dan also ended up building our powder room vanity cabinet. We wanted a modern, glossy/acrylic look and the finished product was even better than we could have imagined. We kept adding on projects for Dan because we were so impressed with his work. 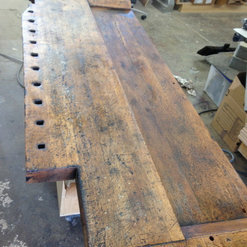 He also made us a bench which used an old cherry wood mantle that we wanted to repurpose - it was perfect! He also refinished a very old armoire that we were practically going to give away and it really looks so amazing. He gave it new life and it looks completely different. He also was very timely and didn't take forever to finish projects. We love his work and highly recommend Dan for any type of high end carpentry or furniture refinishing work. 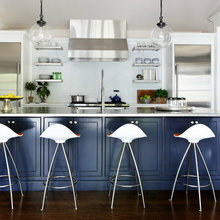 We recently remodeled our kitchen and living spaces and hired Dan Farrace to build our cabinets. He was great to work with and provided great advice as we moved along the remodel process. The cabinets for both the kitchen and family room are beautifully done and provide both great style and function for our new space. Dan was able to translate what we wanted and followed up to make sure the installation was done correctly. 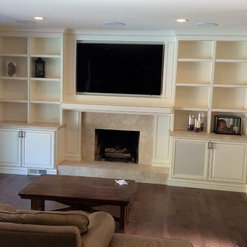 We highly recommend Dan Farrace Fine Woodworking for any cabinet or woodwork you may need. Dan came in and rescued me from a botched job by another contractor. Dan knows his business inside and out. On my job his price was fair, he was timely, and he and his crew were neat and clean. 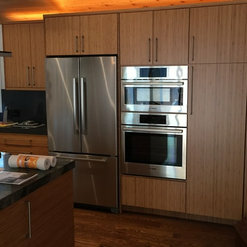 He replaced six cabinets doors in two rooms and finished the cabinets with a beautiful veneer. The finished work could not look better. Highly recommended - in fact I am waiting on his estimate for my next project. Dan is wonderful- he has very high standards for all the work he does and we can definitely appreciate that! 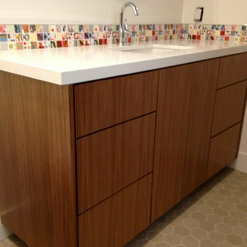 Dan was involved in building the cabinetry for my pantry, laundry room and a bathroom vanity. He did an excellent job on all. Dan is meticulous in his cabinet making, ensuring that all of the details match the specs and most importantly, that the customer is happy. If I ever had a question about the project, he was very responsive to any and all questions that I had. He finished the cabinet work on schedule and my cabinets are beautiful. 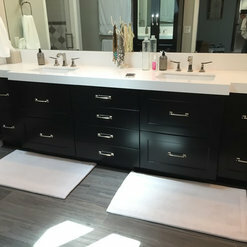 For my bathroom vanity, I drew a concept picture and Dan brought me samples of wood finishes, leg options, and made sure that I was satisfied with the details before starting, If fine tuning was needed following the installation, Dan was excellent about coming back and making any needed adjustments. I had a great experience with Dan during a daunting construction project and he helped put me at ease. I would highly recommend him! Extremely customer sensitive. A pleasure to work with. Very helpful in looking at (and selecting) alternatives. 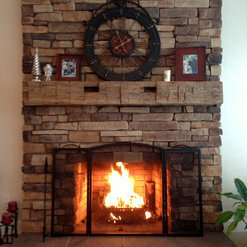 I had Dan and his stone mason install a fireplace with mantel that looks just outstanding and far exceeded my expections when looking at all aspects, including price. I would hire him again in a heartbeat. Very professional and he's a gentleman. Dan and his team were great to work with. Dan was loaded with great ideas that my wife and I couldn't be happy about. The work that they did far exceeded our expectations. Commented: Was this done professionally?Hi Scott, we do all our finish work, This is a conversion varnish paint with van dyke brown glaze then clear coat conversion varnish. hope this answers all questions. Dan. Commented: Would you please tell me the name of the granite and where purchased?Sorry for delay I thought this was already answered, I believe it is Sea Foam Green in a leathered finish. Commented: What kind of stone was used on this fireplace?I think the stone used on fireplace is Bluestone. If you call me I can get masons # for you for the name and place to purchase. 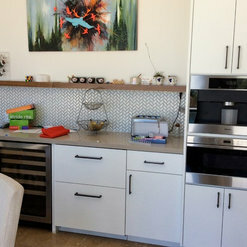 Commented: what are the countertops/backsplash? quartz or marble?Carrara Marble and these were very large slabs. Thanks For your input any other questions feel free to ask. Dan. Commented: I love the hoodHi I think the hood was called a zephyr, only going from what I can remember.